The organizations managing on-farm irrigation system play an important role in managing irrigation schemes to provide water for agriculture production and domestic use. This paper assesses actual situation and operation of the organizations managing small irrigation schemes and on-farm irrigation system in different regions, results of PIM development, successful PIM models then proposes some measures for establishment of water user organizations. These measures are proposed based on scientific and actual bases so that these will support irrigation management agencies as well as local authorities to develop water user organizations suitable with the Irrigation Law. Se San river is one of the four large rivers in Tay Nguyen, which supplies water for about 25 thousand hectares of cultivated land. Furthermore, it is a major water source supplying for the citizens of surrounding areas and supporting for the development of industry and aquaculture. Recently, the opperation of some large hydropower reservoirs in upstream of river such as Pleikrong, Thuong Kon Tum, Ialy considerably affects on the downstream flows. In order to control the efficient use of water, the water balance is very important. The authors have established a modelling of Mike Basin parameters which is suitable for Se San basin, and applied it to control of water balance until 2030, 2050 under impact of climate change. The results would be a database to create scientific and technological solutions for efficiency and sustainability in controling and exploitating the surface water resource inTay Nguyen. Nowaday, Public Private Partnership (PPP) mechanisms in the agricultural sector in general and irrigation in particular are considered as an important solution to mobilize investment resources, reduce state budget burdens, sustainable development.In reality, the demand for investment in irrigation is very high. However, the state budget and financially disadvantaged funds are being cut down, so it can not response. In addition, the intrinsic limitation of the investment sector, exploitation and operation of irrigation works today also require the demand for refactoring to make the function more effectively. In recent years, Vietnam has been interested in and promoted the development of PPP in agriculture and irrigation. The legal documents, mechanisms and policies have been formulated and concretized in the direction of encouraging the participation of organizations and individuals investing in this field. Nevertheless, limitations on the legal basis, cooperation mechanisms between parties, awareness and investment environment remain a barrier to the application of the PPP mechanism in the field of irrigation. The initial results of the PPP application are limited to a number of infrastructure development projects that are not geared towards diversification in the agricultural production chain. The document analyzes the aspects of the implementation of PPP policy in the field of irrigation; point out the results, limitations, difficulties that are currently encountered; bring out the proposal/recommendation to promote the PPP mechanism in the future. For closed basins, especially with upstream of river basins, the rainfall of catchment area reflects how rich or poor about water resources of the watershed. The Central Highlands includes upstream of four major river basins, water resources of this area associated with the rainfall which drops in it. The area of the Central Highlands is quite large with different terrain types, and the annual rainfall also has a clear distribution in space. Presenting the spatial distribution of rainfall on the map gives us an overview of the region's water resources and it is a basical data for calculating water resources for each specific river basin in the study area. From the observating data of the rainfall gauge station in the region, using scientific methods and tools, this paper has developed an anual rainfall map of the Central Highlands, it will help to research and calculate the hydro-meteorological characteristics and it is the basical data for proposing water storage solutions for the Central Highlands. Attracting private sector investment in building socio-economic infrastructure is a great policy of the State of Vietnam to realize the market economy, promote rapidly and sustainably economic growth. The current Government regulation requests all ministries, sectors and localities to prepare and publish a list of investment projects in the form of public-private partnerships (PPP). However, it has not been done seemly. One of the reasons for this is that the methods of identifying PPP potential projects is not clear and consistent. In order to make transparency in investment policy and provide better conditions for private investors to participate in the operation and maintenance of irrigation works in the whole country, this paper will present, discuss methods and evaluation results of the PPP potential projects as well as for attracting private sector to participate in irrigation management. By analyzing project data collected in seven economic zones, the study is identifying potential project groups that may attract investors and then preliminarily specifying the general characteristics of these project groups. Key words: PPP, potential projects, operation and maintenance of irrigation schemes. During the experimental process to determine the suitable irrigation schedule for Grape leaves at the water scarce region, the author observed infiltration process of drip irrigation at two places: (1) Natural soil (without planting crops) and (2) Cultivated soil with Grape leaves. This paper presented experimental results at the natural place (without crops). Based on observed results, the author analysed correlations of parameters as follows: infilltration depth (Z), average radius of wetting front on horizontal direction (R), irrigation water amount (W) and time (t), velocity of horizontal and vertical permeability (VR and Vz) of drip irrigation technique. The correlation histograms of parameters have high value of R2 (from 0.90 to 0.99). Establishing the equation system of homogeneous regression with all verificative results are satisfied, conformable and significant infering the overall in order to apply to suitable water saving irrigation for dry crops (with shallow rooting 0÷45cm) at the Droughty region in the South Central part of Vietnam. Keywords:Correlation, drip irrigation, infiltration process, permeable velocity, regression. The Bay Nui highland of An Giang province includes Tri Ton and Tinh Bien district which owns a huge potential for agriculture developing (such as vegetables, fruits, medicinal plants with high tech methods) and concentrated grazing. Though, due to complex climate change, irregular distribution in space and time of water resources and unusual, harsher flow regime lead to flood in the rainy season, drought in the dry season and seriously water scarcity for production as well as living. At the moment, the agricultural restructuring of Tri Ton, Tinh Bien particularly and An Giang province in general is developing strongly and towarding high tech agriculture. 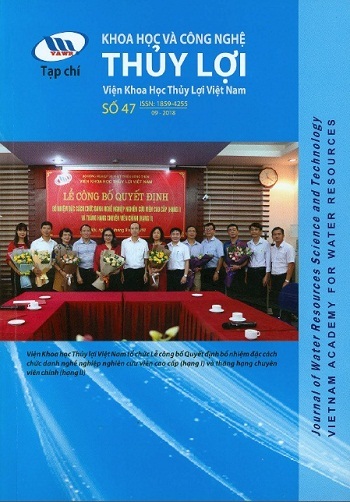 This paper presented to caculate water demand and water balance specifically in this area not only assessing the status of water resources, ability of water demand satisfaction in irrigation systems but also considering them as a basis for proposing water storage remedies for highland to serve the development of agricultural production, contribute to improve local livelihoods, economy and society. Keywords: Water balance, water demand, drought, Bay Nui, Tri Ton, Tinh Bien. Wave climate is one of the important factors affecting the erosion processes and the changes of the shoreline. The shore line at the study area is eroding at the present, in which wave is the main factor. Determing wave climate is essential to provide the base for proposing protection solutions. The article presents the application of TOMAWAC to simuate wave in 10 years continuously. The results including wave height, wave direction and wave period, then, are analyzed to determin wave characteristics in 10 years (2008-2017). Simulation results are used to analysis the wave characteristics such as wave height, wave direction, wave period in the study area. Hon Tre island with steep terrain, unconsolidated rocks and soils, the water flow in the streams are only in rainy season while dry season with no flow. Fresh water for the people on Hon Tre island is scarce and depleted whereas the forest area is decreasing. The main water sources are rainwater, dug wells, groundwater in the cave and under the rolling rocks. The water supply for people's life and economy is difficult due to the ability for water exploitation is limited. The proposed solution is to combine different water sources for water supply. Large-scale water supply systems are not recommended, instead, small-scale distributed water supply systems for group of households should be built. Priority way should be given for exploiting underground water, mountain spring water because these water sources are usually stable whole year with the limited water quantity but it should be fit for the small water supply structuters. Keyword: Hon Tre island, Water supply solution, the shallow groundwater flow, dugged well. At present, the source of puzoolan (natural, artificial) is plentiful, it is used in the manufacture of Portland cement puzoolan or replace a part of cement in the construction of roller compacted. v.v… However, the use of puzoolan as a binder, partial replacement of cement to strengthen the soil in place has not been much research.This paper analyzes the chemical composition of minerals, the lime sorption of natural puzolan extracted in K'rông Nô district of Dak Nong province to evaluate their applicability in soil reinforcement. Comparison of the results of the sample analysis at two locations in the study area according to current standards shows that the ability to apply natural puzoolan is relatively high in the land consolidation in place. The Mekong Delta, in general, and the Cai Lon - Cai Be Irrigation System, in particular, are very important and specially significant in the country development process. However, this place has been facing many challenges and adverse impacts from nature as well as human activities. Viewpoint and vision on the objectives of irrigation works that support sustainable development goals need to be considered comprehensively and thoughtfully. This article provides some analysis, assessment of adverse effects, and the relationship between the objective of the Cai Lon - Cai Be Irrigation System in line with the sustainable development requirement of the region. Keyword: Mekong delta, climate change, sustainable development, natural disaster, flood, drought, salinity intrusion, Cai Lon - Cai Be rivers. In recent years, movable dam has been studied and applied effectively in the Mekong Delta. The stability principle of the dam is to expand the bottom of the structure to reduce the normal stress so that it can be placed directly on soft clay soil without reinforcement or little reinforcement. Characteristics of the movable dam are the horizontal loads and torque greater than the vertical load. Therefore, the problem of sliding stability of movable dam is very important. This article introduce the method of constructing the limited load envelope of the movable dam foundation on soft clay soil. The limited load envelope no dimensional of the movable dam is used in calculating the movable dam on the soft clay soil. Key words: Movable dam, combined loading, failure envelope.